Australia’s foreign minister, Julie Bishop, has voiced concerns over an alleged possibility of the Islamic State group to build chemical weapons. 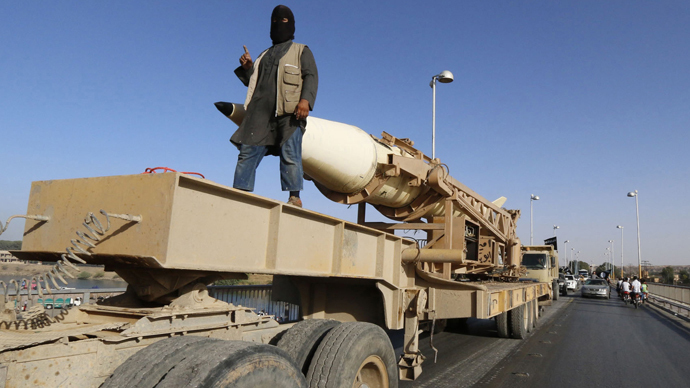 There have been several reports of ISIS using toxic chlorine gas in homemade bombs in Iraq and Syria. “The use of chlorine by Daesh [an Arabic term for ISIS], and its recruitment of highly technically trained professionals, including from the west, have revealed far more serious efforts in chemical weapons development,” Bishop said late on Friday in Perth. “Daesh is likely to have amongst its tens of thousands of recruits the technical expertise necessary to further refine precursor materials and build chemical weapons,” she said. Chlorine gas is a strong oxidizer, which may react with flammable materials. The toxic gas, which was first used as a weapon during WWI by Germany, is on the banned list of chemicals under the 1997 Chemical Weapons Convention. Kurdish officials said its peshmerga fighters, busy reinforcing their positions on a highway between Mosul and the Syrian border, came under attack from an IS suicide bomber driving a truck filled with toxic chlorine gas late January. Authorities say their forces destroyed the truck with a rocket before it had a chance to detonate near soldiers. Shortly after the attack, the Kurdish fighters began to complain of “nausea, vomiting, dizziness and weakness” – all common symptoms of chlorine poisoning. Soon they found “20 empty canisters” in the back of the attacker's vehicle. The Organisation for the Prohibition of Chemical Weapons (OPCW), the chemical weapons watchdog, conducted a fact-finding mission in neighboring Syria last year, where ISIS has been fighting against the Bashar Assad government. According to the OPCW probe, chlorine was used “systematically and repeatedly” in Syria in 2014. Last year, 11 Iraqi police officers were taken to hospital after an ISIS chemical weapons attack, with the Defense Ministry and doctors later confirming their diagnosis was poisoning by chlorine gas. According to a Washington Post report, the Islamic State militants’ chlorine gas attack occurred on September 15, in the town of Duluiyah, located north of the capital. Reports of ISIS militants using chlorine gas on the battlefield appeared after the jihadists seized a large former Iraqi chemical weapons production plant last June. Iraq’s UN Ambassador Mohamed Ali Alhakim said that “armed terrorist groups” took over the Muthanna complex on June 11. The plant harbored 2,500 degraded chemical rockets, formerly filled with a weapon of mass destruction, sarin, and other chemical agents. The Iraqi government told the UN that as a result of the takeover of the plant, Iraq was unable to fulfil its obligations to destroy chemical weapons. US officials has said that whatever was still in the compound had become largely ineffective, however. "Should they [terrorists] even be able to access the materials, frankly, it would likely be more of a threat to them than anyone else,"US Defense Department spokesman Rear Admiral John Kirby told Reuters last July.